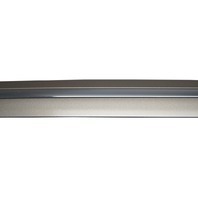 This is the outside trim panel for the front, right (RH) door on 2002-2006 Toyota Camry vehicles. This part mounts on the outside of the door panel on these cars. This part is already painted a tan metallic color that Toyota calls Desert Sand Beige Mica Metallic (Code 4Q2). This part has the chrome strip down the center. This part is brand new and still has the protective film covering the adhesive strip for attaching this part to the door. Replace your old part with this brand new, factory color matching painted part at a fraction of the Toyota dealer.